There’s a quiet revolution occurring in psychiatry. The mental illness burden is felt worldwide, yet psychiatry has not been able to help millions of people who suffer from mental illness, as access to psychiatry and mental health services is at a crisis (Fields and Corbett-Dooren, 2014). Psychiatry is fast becoming trivialized due to its inability to deliver treatment to the population. But gone are the days when doctors had the monopoly on medical knowledge. With the advent of the internet, people can now research their symptoms, possible illnesses, and treatment options before even seeing the doctor. When people are suffering from mental illness and can’t access psychiatry, they still need help. As a result, people naturally look to the internet and research their ailments online. 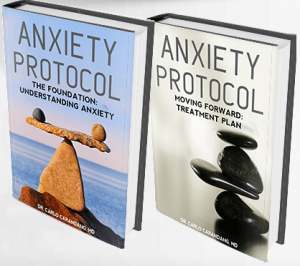 For people with anxiety, this book, Anxiety Protocol, and its affiliated website, AnxietyBoss.com, represent a new option for those who suffer from anxiety but are not able to receive help. This is an online solution that is based on self-help and natural remedies for anxiety. It is for the newer generations who are not pill-poppers and seek a natural, self-reliant way of getting rid of their anxiety. It is for the new generation who are more health-conscious and looking for healthy living options to treat and prevent anxiety. What we offer here is the latest evidence-based program to help eradicate your anxiety. These are evidence-based services and products that have research showing they are effective at eradicating anxiety…all from the comfort of your laptop, tablet, or smartphone. Imagine: a treatment for anxiety that does not involve going to a doctor’s office or hospital. This is the quiet revolution in psychiatry, where a treatment for anxiety can be effective and delivered without a doctor or therapist, without prescription medications (that have multiple and sometimes severe side effects). Certainly, I’m not advocating you ditch your psychiatrist if you already have one. If you have severe anxiety disorder, then you do need to see a psychiatrist. However, for milder forms of anxiety, this online, natural, and self-reliant intervention will signal the beginning of the quiet revolution in psychiatry, where treatment is delivered virtually, online. But psychiatry still has much to offer people who have mental illness. These are important and exciting times for the profession, as it tries to figure out the neurobiological underpinnings of mental illness. Currently, clinical psychiatry does not have objective, biological tests to help confirm mental illness. Rather, mental illness is diagnosed based on history and clinical presentation. However, psychiatry is fast becoming a specialty of medicine based on the brain. The mind, and the various problems and illnesses that are from disorders of the mind, can basically be explained at a molecular level, with neurons communicating with each other via synapses, and these synapses connect to one another via neurotransmitters. These neurotransmitters are the chemicals which carry out the message between neurons, and the receptors of these neurotransmitters are the targets of the psychiatric medications prescribed for mental illness…this is the so-called “chemical imbalance” of mental illness. But mental illness is much more complex than a chemical imbalance. In the brain on a macro level, mental processes have specific circuitry, which connect different parts of the brain, and this circuitry is comprised of the neurons which conduct the message between brain areas. Functional neuroimaging is already revealing preliminary evidence that mental illness is associated with disruptions of these brain circuits, and that treatment can normalize these circuits. It is hypothesized that psychotherapy and other alternative treatments can also normalize these disruptions in brain circuitry. In addition to neuroimaging research, genetics research is on the verge of finding the constellation of genes responsible for transmission of mental illness in families. In the next few years, psychiatry should have objective, biological tests to help diagnose mental illness, and cures may be possible. These are exciting times in psychiatry, given it is at the brink of finding the cause (and cure) of mental illness. On the other hand, it is also the worst of times for psychiatry, given so many people with mental illness suffer without treatment. This book, Anxiety Protocol, and its affiliated website, AnxietyBoss.com, respond to those individuals who often go unheard. It’s been developed to deliver treatment online and virtually. It is our sincere hope that we can reach the millions who suffer from anxiety, and provide them with a natural, online, and self-reliant solution to their ailment.